The Waterpik is a very useful aid for keeping the gums and teeth healthy. It used to be thought that all it did was rinse things out, but it does much more. 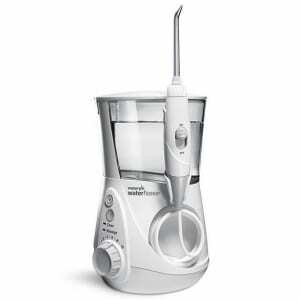 I recommend the Waterpik personal model WP-660. with baking soda added to the water – kills bacteria between teeth. It does not replace flossing; however, for those who do not floss, it is definitely better than not flossing. It is best used in addition to flossing. Really everyone. All ages, usually 6-7 years and older. It is especially useful for deep cleaning around crowns, bridgework and braces (other very beneficial conditions: pregnancy, diabetes, smoking, all people who premedicate with an antibiotic for dental visits). The Waterpik is best used daily, the time of day is truly not important – it is more important that it gets used. The Waterpik is for between teeth, not the outsides. Add two teaspoons of plain baking soda to a full reservoir of water (this gives you a saturated solution which is the required concentration to kill bacteria). You can put mouthwash in for flavor (a capful), but it is not antibacterial unless used undiluted. Most people prefer warm water. Start with tip behind the last tooth and slide forward along the gumline stopping between teeth for 3-5 seconds. Direct the tip directly between teeth, not down into the gums. Use the tip from both the cheek side and tongue side. Leave it out, rather than putting it away. Put the baking soda in an airtight, attractive container (like a French canning jar – the kind with the wire bail). If you don’t have much room, a wall mount is available (you can also use it wherever there is a sink/basin).